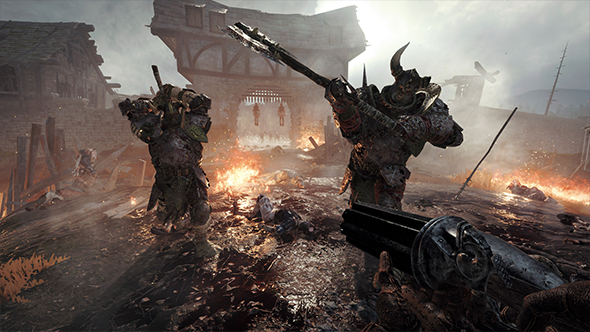 Warhammer: Vermintide 2 is set to release in the not-too-distant future, and we’re still picking up more details here and there about exactly what changes are coming to the rat-battling sequel. The latest information comes from a recent cover story from PC Gamer UK (helpfully detailed on Reddit) that breaks down some of the new careers, the structure of the story, and what to expect from the contract system. Find out much more in our guide to Vermintide 2. Careers include paths like the Zealot, with a flail for a weapon and access to mad prayer abilities, or the Witch Hunter, which backs up melee-focused rapier skills with pistol options. Bounty Hunters are fully focused on ranged abilities, with repeater pistols for primary damage and hammers as a melee backup. Your path through career upgrades is highly flexible, and you’ll be free to switch up your talents and change around your skill trees. Even with set character upgrades, the developers promise player skill is the game’s most important factor. The game will feature 13 levels spread across three story arcs, and each of those arcs will conclude with their own boss battle. The named bosses include Halescourge, Skarrik Spinemanglr, and Bödvarr Ribspreader. They also detailed the contracts system, which provides you with small one-off challenges that have special rewards. Those challenges might be something as simple as clearing a level solo for a particular cosmetic reward, but things can get far more inventive than that. In theory, they could make a “Gone Home”-style experience that’s all about exploring environments and examining objects instead of combat for one of these contracts. You can find out plenty more about Vermintide 2 in our interview with Fatshark CEO Martin Wahlund and lead designer Victor Magnuson.